Civitas Social Housing is asking its registered provider partners to meet a new ‘best practice protocol’ following the financial difficulties of First Priority Housing Association. Andrew Dawber and Paul Bridge, directors in the real estate investment trust’s (REIT) investment advisor Civitas Housing Advisors (CHA), explain how they have responded to shareholders in recent months, as they continue with their ambition to create a £1bn fund by late 2018 or the first part of 2019. Following questions from shareholders about the lessons Civitas can take from First Priority, it has enhanced due diligence processes and set out requirements for RP partners, including independent verification of rents, an indexation reserve fund, sinking funds and rent protection funds. A new protocol contains 10 core principles relating to matters such as financial prudence, resolving any possible conflicts of interest, and management and interaction with regulators. CHA has also expanded its executive team and agreed to publish more frequent net asset value updates in response to requests from shareholders and analysts. It is undertaking “detailed due diligence” of several new potential housing association partners as part of plans to “further diversify the portfolio and reduce the level of concentration attaching to any single housing association”. 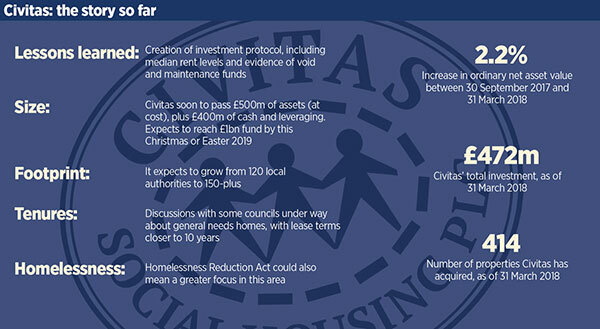 It’s been a year since Civitas set out its business model and ambitions to Social Housing – including how it would transfer leases should one of its RP partners fall into difficulty. It’s been an eventful 2018 which has seen that scenario materialise. Overall, people have been generally “impressed… or surprised” at the speed of market share growth, explains Mr Dawber, with a mix of very positive feedback and some scepticism around the lease model. On that note, the discussion moves swiftly to First Priority, which managed 44 homes for Civitas, along with properties for Triple Point REIT and impact fund Funding Affordable Homes. After assuring investors it would not become a material event that would affect the dividend, leases were duly transferred ‘intact’ to another specialist provider, Falcon Housing Association. Following First Priority, the Regulator of Social Housing (RSH) wrote to about 30 specialist providers – including Falcon – seeking information on finances, lease and governance arrangements, including potential conflicts of interest. Along with some delay to the flow of transactions for Civitas, there were “a few early sellers” among the REIT’s smaller investors, which Mr Dawber says was to be expected. Share prices across the social housing REITs took a dive, with Civitas dropping from 113p to 95p after First Priority. It was at 105p at the time of interview, before dipping to 101p a week later. Some more recent efforts by social housing REITs – including two initial public offerings – have struggled to get away or raise the funds they were aiming for. Mr Dawber says: “People have been a bit disturbed by First Priority, it has knocked some confidence – it has meant investors felt they needed to get more up to speed with the sector and understand the nuance. Mr Dawber suggests there are also a number of macro elements coming into play in the equities markets, from the end of quantitative easing to Brexit to Carillion, and that there is also generally less appetite for ‘follow-on funds’. But he says there is still investor appetite for specialist supported housing, albeit there has been “a degree of further education”. Shareholder perception therefore appears to be the main driver for moving away from First Priority. Mr Dawber adds: “We hoped the process would move faster, and understand it’s complicated, but we’re a public company – our equity investors were looking to us to bring about a resolution and it’s difficult when you’re not in charge of the process. The leases were reassigned with the consent of First Priority and support of the care provider and other stakeholders, making it a “very consensual process”, he adds. But does such an action demonstrate that the shareholder always come first? “It’s also the interest of the tenants,” says Mr Bridge. Mr Dawber adds: “I can’t imagine we’d ever knowingly do something that’s against the interest of the tenants. If the process had been faster then maybe we could have stayed in situ. For some, the problems at First Priority also open up the debate about the Civitas model, including index-linked lease arrangements and whether equity funds demand higher rents. Mr Dawber and Mr Bridge’s position is that “there’s nothing wrong with the business model”. “Wht we found when we looked at all properties is that rents were at the right sort of level; [they were] agreed with local authorities – and indexation… was not an issue as most properties were at their base rent. The pair say they are taking action, however, to formalise what they call their “investment protocol”. This includes a commitment that rents will not be set above “the median”, and that a transaction will not take place unless there is a void fund, maintenance fund and “generally speaking a year’s rent for all the properties”. Mr Dawber says that while this is how Civitas has tried to transact since it began, it has now been “codified and shared” with RPs and other stakeholders. “What we say to our HAs now is not just, ‘This is how we want to transact together’, but, ‘This is how we want you to transact with us’. It also means a more granular approach to voids and more time talking to Civitas’ 70 care providers. First Priority’s latest accounts show that it had £2m out to debtors. But Mr Dawber also concedes that there will always be some risk. “It’s not a perfect, sealed world this, because we don’t run the associations… The important thing the shareholders have seen is we’ve come away from this with no loss. So we’re in a situation where we have delivered on what we aim to do. “But there are clearly lessons we can learn – we’re not too proud to say that. Another area of focus for the RSH is any potential conflicts of interest between small RPs and property investors or developers. So how does Civitas’ own due diligence consider this? The pair say they have turned down more than £300m of transactions as a result of their due diligence and acquisition requirements. Mr Dawber says: “There are potential conflicts of interest everywhere – what’s important with them is that they are disclosed and transparent so they can be dealt with. “If you have a member of a board who happens to be part of a developer, you wouldn’t expect that individual to be taking investment decisions in respect of his own properties and his HA, and you’d expect that to be disclosed. “Where they cause a problem is when they’re not properly disclosed, or where there’s a suggestion but you can’t get to the information so you don’t know what someone’s true motivations might be. Mr Bridge adds that each transaction has independent legal advice and assurances from the RP that there haven’t been known conflicts. “We have to take that as their declaration,” he says. Mr Bridge also points out that specialist supported housing is still a new market, with some small associations set up by families who may want professional support.